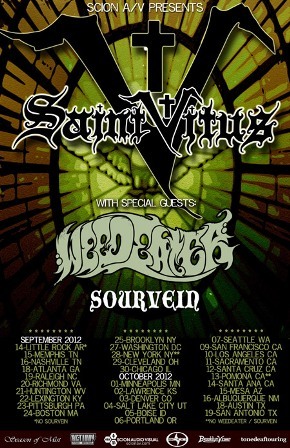 World famous doom metal band SAINT VITUS has announced a U.S. headlining tour; it's first since 1993. The award winning group -- featuring guitarist Dave Chandler, vocalist Scott "Wino"Weinrich, bassist Mark Adams and drummer Henry Vasquez -- will kick off the five week long jaunt on September 14 in Little Rock, AR. Presented by ScionAV and Brooklyn Vegan, the tour will run through October 19 and will include support from both Weedeater and Sourvein. 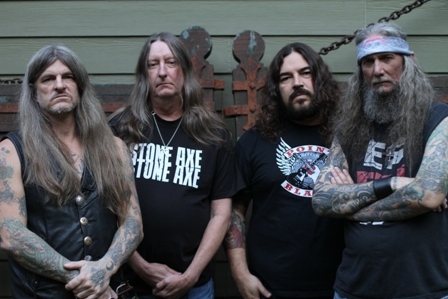 SAINT VITUS will be touring in support of its recently released eighth studio album, titled Lillie: F-65. "We're stoked to destroy America again; the last SAINT VITUS U.S. headlining tour was in 1993," commented Dave Chandler. "This time we'll be playing "Lillie" as well as fan favorites and some old surprises. Leave your ear plugs at home and come bleed with us."